Hook rugging should not be mixed up with latch hook rug making, where short lengths of wool are locked through themselves, giving a grass like texture. Hook rugging is done with long continuous strips of material. 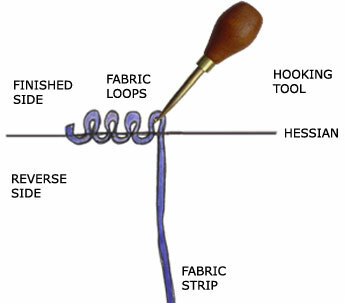 These lengths of material are hooked with a hand tool from the finished side of the hessian leaving a looped surface. The hook used is similar to a crochet hook but with a sharper point and a bulb end, which is held in the palm of the hand. Prepare the fabric by cutting your chosen material into 1cm wide strips. Before you start hooking, give each strip a slight stretch lengthwise. Place one hand on the finished side and the other on the reverse side of the hessian, whilst holding the fabric strip on the reverse side (underside). The hooking tool is always worked from the finished side. Push the point of the tool through the hessian and pull a loop of fabric strip through from reverse to finished side using the hook. Repeat the process moving in the desired direction until either the end of the fabric strip is reached or the colour area is filled. When you feel comfortable with the technique, try experimenting with different materials, colours and textures. Aim for a visually pleasing and tactile feel to your work. Any fabric can be used, but tee shirting holds well in hessian and is ideal for beginners. Chunky Aran type wool also gives good results. 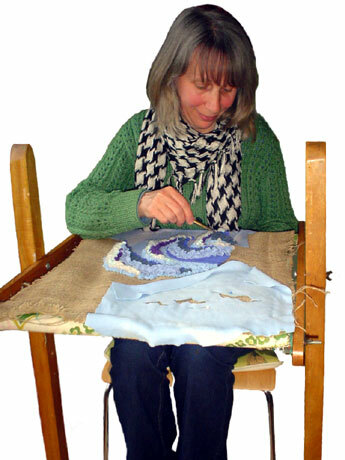 Some people find it easier to stretch the hessian over a frame, whilst others are happy to work with the hessian loose in their lap. Ensure the start and finish ends of the fabric strip are on the finished side of the hessian i.e. the side that will be viewed, so they can be trimmed neatly afterwards. Before you start, I recommend that you fold and sew the edges of the hessian to prevent ends getting frayed and caught as you work. Even when doing a frame edge the same colour as the background, fill it in last. Working along the edge rather than up to the edge gives a neater finish. The speed shuttle was patented in 1917. There are photos of women using them on large frames set up in the backyards of back-to-back housing. With the shuttle, the piece is worked from the reverse side (underside). This tool fills in large areas quickly and evenly.